Mid-November to mid-January tends to be my period for “catch up” reading. With various prize competitions finished and very few new releases on the horizon, it is a time to finally get to all those books that have hit the radar during the year and been put aside due to more pressing demands. 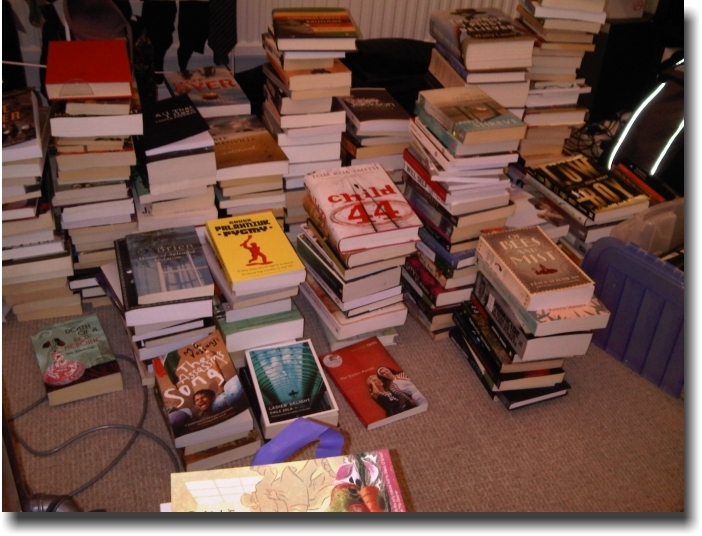 When I looked at that pile this year, it came with another observation: Almost all the books at the top of the pile had come to my attention from the blogging world. KevinfromCanada did not exist as a blog at this time last year, but I was an active commentor on a number of blogs that I found informative — indeed, I eventually started this one because I was getting embarrassed by the increasingly lengthy posts I was putting up on other people’s blogs. So as KfC approaches its first anniversary — and the 2009 “catch up” season begins — I’ve opted for a mini-project. It is a tribute to some of the bloggers whom I followed before I got into this most enjoyable hobby and will feature novels that came to my attention through their thoughts and comments. First up is Reading Matters, the literary blog of kimbofo, an ex-pat Australian, a journalist based in London (tweet, tweet — and that is not a reference to Twitter) and a frequent visitor to Ireland (it is amazing what love does when it comes to travel). She lives in a constricted flat in that wonderful city (space is a major issue for any devoted reader in London and kimbofo certainly shares her challenges — the picture above is her recently posted TBR pile), so that makes her my current expert on matters ranging from the West End to Kensington and even Bloomsbury, since she visits there often — they are important literary neighborhoods, so that is no mean recommendation. I appreciate that expertise very much (please, kimbofo, could you find the shop where Henry James purchased “the golden bowl”? — I know it is near Great Russell Street). If you don’t already know, kimbofo is also the blogging world’s leading expert — and advocate — of John McGahern, the outstanding Irish novelist who died just three years ago. I’d always been reluctant to try McGahern (he seemed just too Irish by description); it was kimbofo on her blog and in comments at John Self’s The Asylum who convinced me he deserved attention. I started with his best known work — Amongst Women — and loved it (you can find my review here and kimbofo’s here). I resolved to read more. The Leavetaking is one of McGahern’s lesser-known works. While all of his novels have strong autobiographical components (his mother died of cancer when he was young, his father was a brute — those two elements are almost always present), this novel, first published in 1974, includes another element. Just as McGahern lost his job as a teacher in a mess of Irish Catholic politics, Moran, the central character of this book, is about to lose his. Moran’s “crime”? While taking a year sabatical in London, he fell in love with and married an American divorcee — that means he is living in sin in the eyes of the church and cannot teach school. “Should we have a drink to celebrate?” I asked and his face fell: fear that he had just hired a drunkard. His finger searched to his lapel, “I must have left my pin in the other suit,” he explained in confusion. “That’s an idea,” he relaxed in relief. We passed The Yacht as if it was a house of shame. “Young teachers should stay clear of the pub. There can be too much free time in the profession. I’ve seen too many in my day come to grief on the high stool,” he advised as we reached a sweet shop and stood for a few minutes beside a pile of Sunday papers drinking lemonade from bottles through pale straws, but my appointment was now secure. It was all of nine years ago. We chant the prayer before work. They take out their books. Mechanically I begin the lesson of the afternoon but I have no desire to bend to its arid discipline today of all days, if indeed I ever had. I’d never have been a teacher, I see clearly, but for my mother. Her dead world comes to life in my mind as I drift away from the classroom and out of this last day in it on a tide of memory. “Who do you love most in the world?” my mother used often to ask me in the evenings. “You, mother,” I answered in that dead June evening. To get her love I’d have to trot out the catechism answers that I hated. “I love my earthly mother and father and brother and sisters equally.” I resented then having to affirm what I did not feel. The rest of the first half of the book is devoted to Moran’s memory of that relationship (his mother wanted him to be a priest but teaching was entirely acceptable as “the second priesthood”). Like McGahern’s own mother, Moran’s has a difficult relationship with her husband, again like McGahern’s father, a member of the Garda who comes home from the barracks only occasionally, usually to father another child. Moran’s leavetaking of his mother is one of the more poignant that can be found in fiction. The second half of the book is much faster-paced, less introspective and quite a bit easier to read. It tells the story of Moran’s year in London, how he came to fall in love and how he returned to Ireland, in the full knowledge that his unChurched marriage would eventually lead to his dismissal. It shares with part one an inevitability that is reflected in the title of the novel: everything that we do will eventually result in a leavetaking. McGahern rewrote this section of the book a decade after it originally appeared: “The more I saw of it the more sure I was that it had to be changed. The crudity I was attempting to portray, the irredeemable imprisonment of the beloved in reportage, had itself become blatant.” I haven’t read the original version, but this rewritten one is anything but “crude” or “blatant” — there is not a lot of anger or even emotion to Moran’s reaction to his unfortunate circumstances, rather there is a certain weariness about what must be, however unfair that is. For me, The Leavetaking is not as complete or accomplished a novel as Amongst Women — it lacks the depth of story and characterization that that book has. Yet when you know McGahern’s own story and how closely this book parallels it, this becomes an important book. It is an author’s clear-eyed and unforgiving look at a version of his own history and it is told with a muted passion that can only be admired. Thanks, kimbofo. Without you, I would never have read McGahern — and I am glad that I have now moved two books into the project. Interested visitor’s can find reviews of all of his novels but one (kimbofo is reluctant to finish her reading of McGahern) at Reading Matters. I’ll confess to a high level of ambivalence when it comes to the Nobel Prize for Literature, particuarly in recent years. I don’t follow it closely, but do pay some attention — and usually find myself reacting with some puzzlement each year when the winner is announced. Despite that distancing, the winner’s name tends to stick with me and often, a few years later, that memory is enough to provide the incentive to read at least one of the author’s books. The announcement of Orhan Pamuk as the 2006 Prize winner sparked more personal interest than usual. A citizen of Turkey who writes in Turkish, Pamuk has spent significant time in the United States and is a visiting professor at Columbia (He is now writer-in-residence at Bard College). Turkey — specifically Constantinople, Instabul where this book is set — has represented the crossroads between East and West in both trade and thought for centuries. That role today is perhaps more important than it has been in many recent decades, particularly as Turkish political leadership looks to joining the European Union. Pamuk describes that East-West tension in his two best known works (the IMPAC-award-winning My Name is Red and Snow) and even faced criminal charges for comments he made about how Turkey had treated both Kurds and Armenians. And finally my favorite Nobel winner of all time, Ivo Andric’s A Bridge on the Drina, explored those same East-West tensions from the Western side of the crossroads in what was then Yugoslavia. So when I saw that Pamuk’s new book, The Museum of Innocence, was due for English-language release, I signed up for a copy. I did so with some trepidation — some blog and forum scanning indicated both a complexity and a modernist style that would produce a challenge, given my reading tastes and style. I admit up front that The Museum of Innocence is the most difficult book that I have read to the finish this year, although complexity and modernism did not prove to be the problem. Rather, the incredibly slow movement of the book and the relentless exploration of apparently trivial detail produced a frustrating ennui (that reads better than “boredom”) that frequently had me wanting to simply abandon it. And then, quite suddenly, Pamuk would arrive at an observation that demanded attention — and a commitment to finish. Eventually, I adopted a pattern of reading 40 or 50 pages and setting the book down. I’m glad I read it but I warn those who contemplate The Museum of Innocence that it is a very challenging read. At it’s most obvious level, The Museum of Innocence is a story of love (and obsession) — a relationship that happens in the reverse of the more usual unrequited love story. The first person narrator, Kemal, tells the story from a perspective some decades in the future; indeed, we are aware early on that he is telling it as a guide to the physical museum he has established to commemorate the relationship. The story starts in 1975 (almost exactly a half century after Ataturk ended the Ottoman Empire and started the Turkish Republic) when a 30-year-old Kemal spots a designer handbag from Paris in the window of a fashion shop and decides to buy it for his fiance — they both come from wealthy Instabul families who are eager to show their modernity by adopting European mores and purchasing European goods. Kemal immediately falls in love with the 18-year-old clerk, Fusun, who is a distant relative he knew in childhood but whose family has fallen out of favor because as a 16-year-old she took part in a beauty contest (there is a limit to just how European we can be). I sometimes caught myself thinking that I would be able to continue seeing Fusun after the engagement. This heaven, in which everything would go on as before, slowly evolved from a fantasy (let’s call it a dream) into a reasonable hypothesis. If she and I could be this passionate, this generous, making love, then she could not possibly leave me, or so I reckoned. In fact, this was my heart talking, not my reason. I was hiding these thoughts even from myself. When I was ten, my parents attended the opening of the hotel, a very exciting occasion for them, along with all of Istanbul society, as well as the long-forgotten American film star Terry Moore. We could see the new building from our house, and though at first it looked foreign against Istanbul’s tired old silhouette, during the years that followed my parents grew accustomed to it, going there whenever they could. Representatives of foreign firms to whom my father sold goods — they were to a man all interested in “Oriental” dancing — all stayed at the Hilton. On Sunday evenings, when we would go as a family to eat that amazing thing called a hamburger, a delicacy as yet offered by no other restaurant in Turkey, my brother and I would be mesmerized by the pomegranate-colored uniform with gold braids and flashy buttoned epaulettes of the doorman with the handlebar moustache. In those years so many Western innovations made their first appearance in this hotel that the leading newspapers even posted reporters there. If one of my mother’s favorite suits got stained, she would send it to the dry cleaner at the Hilton, and she liked to drink tea with her friends at the patisserie in the lobby. The passionate, but brief, affair with Fusun ends; not long after so does the engagement. Kebal begins his long quest of Fusun and falls into the obsession that will dominate the rest of his existence. It takes more than a year for him to find her, by which time she is married to an aspiring filmmaker (he wants to direct a European-style “art” film) although they are so poor that they continue to reside with her parents. Kebal uses the pretext of being able to finance the film to begin an almost eight year relationship where he shows up regularly at the house for dinner and the evening — he will go there for supper 1,593 times in a period of 2,864 days (don’t say I didn’t warn you about detail in the book). Almost immediately he begins what will develop into a conscious project of pocketing whatever mementoes he can (salt shakers, lipstick tubes, plastic dogs that sit atop the television) that will eventually become the exhibits in his “museum of innocence”. In Physics Aristotle makes a distinction between Time and the single moments he describes as the “present”. Single moments are — like Aristotle’s atoms — indivisible, unbreakable things. But Time is the line that links these indivisible moments. … Clocks and calendars do not exist to remind us of the Time we’ve forgotten but to regulate our relations with others, and indeed all of society, and this is how we use them. My life has taught me that remembering Time — that line connecting all the moments that Aristotle called the present — is for most of us a rather painful business. When we try to conjure up the line connecting these moments, or, as in our museum, the line connecting all the objects that carry those moments inside them, we are forced to remember that the line comes to an end, and to contemplate death. Those three story lines — pursuit of Fusun, obsession extended over time, East-West tensions — all continue but they are explored, rather than developed. It is that relentless exploration which makes The Museum of Innocence such a difficult book to read. While one can admire Pamuk’s persistence and devotion to detail, there is not a lot of readily accessible substance to it. I can certainly understand that readers with different tastes and approaches to reading would find this an “easier” and probably more satisfying work than I did. I neither recommend nor discourage — I hope this attempt at a summary supplies enough information to help those who are contemplating reading it reach a decision. For my part, I’ll be interested in what I think a few weeks or months down the road — Aristotle has a pretty good point in the notion that one of Time’s purposes is to serve as a line that connects those moments that we remember. We shall see how reading this book lands on that line in the future. So before someone asks in a comment: “Have you read Dead Souls?” — the answer is “no, I haven’t, but I intend to”. On the other hand, while perusing the Hesperus Press site recently, I came across a version of Nikolai Gogol’s The Squabble and swallowed the baited hook immediately — I’d heard about the novella before and a growing affection for Hesperus volumes supplied the rest of the motivation. Even for those of us who like nineteenth century Russian writing, Gogol is a bit of an enigma. He died young at 43 and his work pretty much comes down to three sets: the aforementioned Dead Souls (intended to be volume one of a trilogy), the Petersburg tales (including his best known work, “The Greatcoat”) and the Mirgorod (four stories, three of which are included in this volume), which develop the theme of a Little Russian town, in the Ukraine. And before anyone points out that Gogol is Ukrainian, not Russian, I do know that. Ivan Ivanovich has a glorious coat! Quite excellent! And what lambskins! They’re grey-blue with a touch of frost! God knows how much I’d bet that nobody can be found with any like them! Just look at them, for God’s sake, especially if he starts talking to someone, look at them from the side; what a feast for the eye. Indescribable: velvet! silver! fire! “You, Ivan Nikiforovich, are fussing over your gun like a bear with a sore head,” said Ivan Ivanovich in annoyance, because he was truly beginning to get angry now. That is about as quick a summary of pointless conflict escalation as you could ever ask for — and it is that last statement, with its reference to being “a goose”, that sets off the Jarndyce vs Jarndyce conflict that dominates the rest of the novella. Both Ivans swear complaints; while all of Mirgorod (which translates as “Worldtown”, according to translator Hugh Alpin) want the conflict to end and the friends to be reconciled, they foolishly decide instead to pursue the squabble in the courts, where it languishes without decision (“it will come tomorrow”) for more than a decade. You can start to imagine the consequences — Dickens would certainly have no problem on that count. If you don’t already know the outlines of the story, the pig does play a major part and real geese (well, at least a goose coop) play a major factor. The Squabble has much to recommend it. A pointless dispute escalates, bureaucracy takes over (Patrick McCabe in his introduction to this volume makes reference to both Franz Kafka and Monty Python as comparisons and both are valid) and disaster, of a sort, ensues. For this reader, the work fits a definition of the “perfect” novella: You spend much more time thinking about it after reading it, than you spent in the reading. That for me is the ideal definition of the genre. This Hesperus volume contains two other stories from the Mirgorod series: Olde-Worlde Landowners and The Carriage. The first is Gogol’s version of the Philemon and Baucis myth, an extremely old couple who when offered a reward by Zeus ask only to be allowed to die at the same time — it is a very charming story. The Carriage is slight but worthwhile — an examination of how ego and the desire to move above your station sometimes provide a disastrous result. 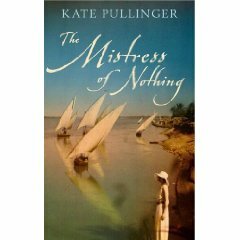 I think most avid readers would agree that there are days when you would like to pick up a volume, knowing that in only a few hours (this book is about a two hour venture the first time through, but you want to read it more than once) you will have finished it and be able to put it down, saying “that was more than worthwhile”. And many days later, you are still thinking about that experience. The Squabble perfectly fits that description. I’m not sure when I’ll get to Dead Souls but this diversion ensures that I eventually will. One of the intriguing omissions from the 2009 Giller Prize longlist was the absence of The Last Woman by John Bemrose from the list of 12. His first novel, The Island Walkers, was shortlisted for the 2003 prize and made the ManBooker longlist the following year, so his second effort certainly seemed to be a likely candidate. I had it on hand but set it aside in the pressures of reading the longlist and finally got to it only recently. While I can understand the jury’s decision, The Last Woman is a worthwhile read — the book has its problems, but it also has much to recommend it. Ann and Richard live in a Northern Ontario city — he is a lawyer and she an artist who is going through a creative dry patch. They also have a cottage on Lake Nigushi, next door to an Ojibway reserve and most of the book is set in this area. Bemrose establishes the structural elements of his plot early on — the third major character is Billy, the former chief of the Ojibway nation, who has returned after a 10-year absence. That absence was caused by the loss of a native land claim case that he had led; Richard was the lawyer on the case (his first big one) and the two had a falling out when the judgment was delivered. Deeper in history, Ann as a nineteen-year old had a summer affair with Billy (some years before the land claims case) and has never totally got over it. In fact, she took up with Richard because he was “solid” — too solid, as it turns out. He has now gone conventional and is angling for the nomination in the local provincial Legislature riding. His wife is sitting on the deck overlooking the channel, her arms laid along the boards of a Muskoka chair, her face lifted to the sun. Richard is certain she must hear them (note: Richard is accompanied by their young son) — their outboard racketing down the channel — yet it is several seconds before she turns her head, almost lazily, in their direction. He raises his hand, yet the woman in the deep chair simply goes on looking at them, as if the boat gliding toward her were invisible. After his sister moved out, Billy lived on in the blue house with Matt and Emma. In the winters, they ran a trapline from their cabin at Silver Lake; in the summers, he and Matt did building and repair work at cottages around Nigushi. Working with Matt calmed him. The way Matt took his time when he measured a board or the way he pondered where they should hunt — taking days if necessary, while he watched the weather and the plants, and waited for the right thought, the right dream, to guide him. It drove him wild at first, though in the end he had managed to take something from it — a deeper patience, an alertness that showed him more detail (that twig where a moose had nibbled) than he had known existed. Devoted readers of Canadian fiction at this point are probably observing: “This sounds like it has a lot in common with Through Black Spruce,” Joseph Boyden’s 2008 Giller winning novel (reviewed here). It is a fair observation and I am afraid that Bemrose suffers in the comparison. Much of The Last Woman is an exploration of the historical events that produced these circumstances; all competently done, but with few surprises. The links with the present are pretty direct. Just as Ann is becoming impatient with Richard’s “solidness”, the reader grows impatient with the “solidness” of the book. Bemrose is a good writer but the reader does feel like he/she is taking part in a patient canoe ride across the lake (there are quite a few of those in the book, too) rather than being part of a reading adventure. The Last Woman does speak to some important Canadian and human themes. The situation the Ojibway face in both the past and present tense is a realistic portrayal. The tensions between the three characters are equally real. The problem is that all of those elements are rather predictable. I also suspect the novel does not travel very well beyond Canada, another reason why a three-person jury including both a Brit and an American would find it lacking. I read The Last Woman in a single day. At 323 pages, that is a testimony to the author’s ability to put together a highly readable piece of work, although I certainly wouldn’t call it a page turner. I’m glad I read it, but for those who need or want to be more selective in their approach to Canadian fiction, I have to say there are better places to turn for the experience.